★ Most Value for Money Breastmilk Saver [2017/18 Model Lotus Design] – Silicone Manual Breast Pump to collect “let-down” / breast milk leaks and relieve engorgement using pure natural suction pressure. Every ounce of breast milk is precious. Save it for your baby. ★ Extremely Soft, Comfortable and Safe – High Quality Silicone breastpump. BPA Free and 100% FDA Approved Food Grade Silicone. Lab tested and certified by Bureau Veritas which is a World Leader in Testing, Inspection and Certification. 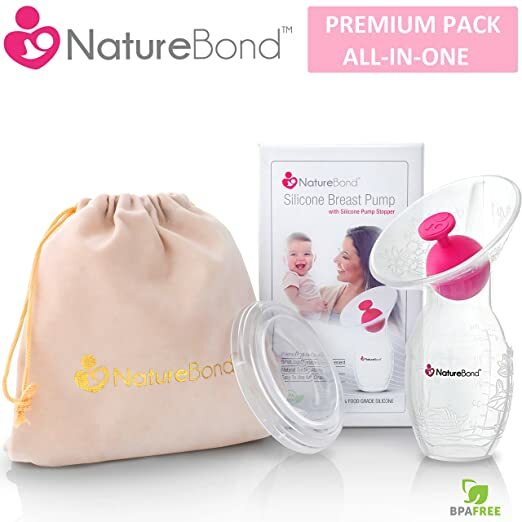 ★ All-in-One – Complete set with Air-Tight Vacuum Packaging, 1 x Dust Cover Lid, 1 x Luxury Pouch, 1 x Silicone Breast Pump and Full Colour English Instructions, with Quality Hardcover Box packaging, which make it ideal as baby shower gift for newborn mothers. ★ Very Light and Perfect for travelling. Hassle free and fit perfectly into any handbag or diaper bag. ★ Recommended by lactation nurses in Texas Health Presbyterian Hospital (USA). #1 Silicone Manual Breast Pump in USA, UK & Canada. Recommended by lactation nurses from Texas Health Presbyterian Hospital, USA. Manual and Hassle Free. No wires and assembly of pump.